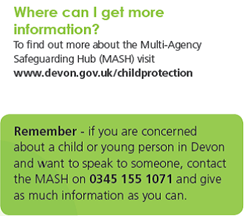 MASH is a partnership between Devon County Council children’s social care, education and youth services; Devon NHS health services; Devon and Cornwall Police; and the Probation Service working together to safeguard children and young people. When a professional, family member or member of the public is concerned about a child or young person’s safety, they can contact MASH. They deal with all enquiries/referrals where there is a child protection concern. Devon Children and Families Partnership has an Early Help strategy to protect children or young people in Devon and provide help and advice to families as soon as they need it. Early Help is about more than child protection: it is about making sure that children living in Devon are safe, happy, healthy and well educated. Early Help co-ordinators work across Devon to ensure that those children and families needing help are receiving it from the right professionals. If you feel that your family would benefit from Early Help, please contact a Designated Safeguarding Lead at the College. 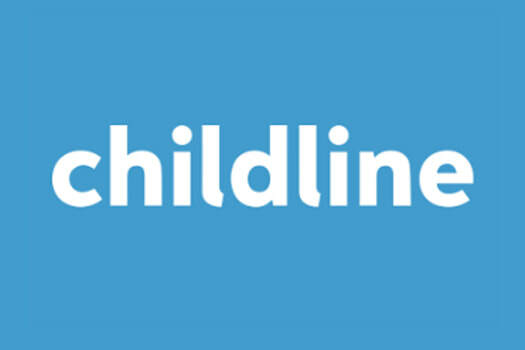 ​Childline is a private and confidential service for children and young people up to the age of 19. Childline counsellors are trained staff and volunteers who all have experience of listening and talking to children and young people.